Product Description: Perfect for the dry winter months! Carrot & Castor Conditioning Hair Oil keeps your hair moisturized between washings. Great when used moderately as a daily hair oil. Carrot oil is rich in beta carotene, vitamins A (for a healthy scalp) and E (helping to stimulate hair growth) and pro vitamin A. Castor Oil is a natural humectant that draws moisture out of the air bringing it directly to the hair shaft. The hue of the oil comes from Carotene (deriving from the the carrot root extract) giving it it's golden orange glow. Ingredients: Glycine Soja (Soybean) Oil,Daucus carota sativa (Carrot) Root Extract, Cocos nucifera (Virgin Coconut) Oil, Ricinus communis (Castor) Seed Oil, Simmondsia chinensis (Jojoba) Seed Oil, Brassica oleracea italica (Broccoli) Seed Oil, Oryza sativa (Rice) Bran Oil, Olea europaea (Olive) Fruit Oil, Aloe Barbadensis Leaf Extract, Prunus dulcis var. amara (Bitter Almond), Litsea cubeba (Litsea), Tocopherol (Vitamin E). Product Description: This product was created out of desire for the total package. Nothing too thick, too oily or too heavy but I wanted something that would coat and protect my hair (specifically thick natural, highly textured coils) when wearing a plaited style longer than a few weeks - all while nourishing and strengthening my hair. After 2 years of formulating Ginger Juice & Berries, I finally came up with the perfect recipe that meets all of those hair demands. Another bonus that was discovered is the lack of heavy product build after wearing a style for an extended period of time. My Thoughts: Lavida reached out to me weeks ago to try some of her hair goodies, but once they arrived I couldn't figure out to use them lol! There was no directions on the label. So after contacting Lavida I was ready to give them a try with her usage recommendations. I start off by shampooing my hair and once cleaned I applied the Carrot & Castor Conditioning Oil in 4 sections. I could definitely feel the softness immediately. The color, just like the GJB Hairdress, is very...orange, but I didn't think too much of it. The 4 sections were then braided and air dried until 80-90% dry. I then divided my hair into smaller sections and applied the Ginger Juice & Berries Hairdress to create medium sized, stretched 2 strand twists. The look of this product reminds me of carrot baby food lol! I was like ehhhh...but I went with anyway. I used just a little for each twists, because I didn't want my hair to be too greasy. Once finished my hair looked and felt great! It was soft, the twists were smooth and the shine was incredible. Lavida had this to say about my review "Thank you for the review. It's great! I'm going to consider formulating a pomade w/out Carrot Oil and alkanet root. I appreciate your thorough honest review." I snapped these pics a few weeks ago...early morning...face puffy...walking the dogs. My hair was cute though :) The hair is a result of using KBB Hair Nectar and EcoStyler for a wash & go. I love tea! I drink a cup of green tea almost every morning for a quick pick me up. Lately, I've been seeing a lot of post about Black Tea rinses and how they can reduce shedding and make hair stronger. After reading this post http://www.justgrowalready.com/2010/07/black-tea-rinse-i-you.html, black tea rinses are now on my list of things to try. Below is an article that points out 8 key reasons why tea is so great for your beauty regimen. Polyphenols - This is one ingredient that puts tea into the beauty category. It fights plaque causing dental bacteria. Green and black tea even helps to fight cavities. Polyphenols is also an anti-oxident that protects you from free radical damage. Green Tea - In a recent study, people who drank green tea burned more calories than those who consumed caffeine alone. Now is that a good reason or what! Nettle Tea - This tea boosts circulation and hair growth while adding shine. Brew a half cup, allow to cool and then massage into the scalp, leave for 5 minutes or so and then rinse. Rosemary Tea - Brew a cup and then allow to cool. Saturate hair for five minutes or so and then rinse with cool water. All the residue that has been dulling your hair will disappear. Creating Highlights - I have actually seen this work. My niece actually darkened her blonde hair with tea. If you have red hair, green tea is the color of choice. Chamomile tea will add blonde highlights, black tea will add a glow to dark hair and for gray hair, try ginseng. More Notes on Color - In India, women combine strong Indian tea with cloves to darken greying hair. In Jamaica, rum is added to the tea to bring out highlights. Now this might be folklore, I'm not sure, but one source claimed that gypsy women would happily drink nettle tea to keep their hair black and glossy. From that, I have to wonder about the taste or could it be a warning of something else?? Be Sure To Rinse - Even though tea has lots of anti-aging properties, it can still stain your teeth. After each cup, be sure to rinse. Nothing is worse than yellow teeth. The Anti-Aging Part - In the last tip I mentioned anti-aging, so I thought that I would elaborate just a little. It seems that regular tea drinkers have a reduced rate of heart disease. And this study claimed a whopping 44% reduction. The gorgeous new faces of Carol's Daughter sit down with Lisa Price and talk "good" hair, hair acceptance and a bit about what their hair means to them. I've never tried CD products...never paid the brand that much attention. However, I'm loving this ad campaign and can't wait to see more videos with these ladies. "It's not a pet" lol @ Solange! Are you a fan of Carol's Daughter products? ** Check out this interview from NecoleBitchie.com where Lisa address the "skin color" controversy in the new ads! •Keep them clean. Dirty nails is a pet peeve of mine and it's actually pretty gross. When you clean your hands don't forget to pick out any dirt, even if it appears as though nothings there. We carry a lot of bacteria under our nails and don't even realize it. Also after every wash moisturize your hands with a good lotion or cream. •If your nails chip/breaks/snags mend it right away. I always carry a nail file in my purse just in case I break or chip a nail. Not only will it prevent more damage to the nail, but if you suffer from HIH (hand in hair) disease it can snag and cause breakage in your hair. •Maintain a clean shape. By that I mean, keep the edges of your nails smooth..no rough edges. I prefer a square/rounded shape and I usually file them every other week. •Between the age of 14-21 I was obsessed with acrylic nails and I would by nails done faithfully every other week. But then I moved farther away from my fav spot and didn't like how the local shop applied my nails so I just stop getting them done all together. My nails were soooo then and damaged, but the slowly but surely regain their strength and the tips of my nails became a lot brighter. It doesn't make or break have healthy nails whether you'll healthy nails or not but I should mention that I do NOT wear polish...at all. Not even clear..I just don't. •Lastly, just like when striving for better hair and skin diet does play a part. Drink plenty of water and take your vitamins regularly. Again I wouldn't consider this a regimen, but hopefully these tips can help you achieve health nails! If you have any other questions on my nail care please leave them in the comment section below. Hair Diary • Meet Keri of YesNatty.com!! About me...My Name Is Keri! I am a student at John Jay College of Criminal Justice. I am a die hard lover of fashion I’m also building up my fashion empire slowly that is known as Yes! Natty. I’m a makeup artist, blogger, secret stylist and lover of life. Where do you live? How's the natural hair/loc community there? I live In New York. The natural/loc community where I live isn’t huge in terms of locs, fros or just big curly natural hair. I’m surrounded by a lot of latinos so that’s mainly what I see in the BX. However, When I venture into the city I see lots of locs and big curly luscious hair. When and why did you decide to loc your hair? Believe it or not I always wanted locs, literally. I would say when I was 11 I definitely knew that I would loc my hair sooner than later, I made many attempts to loc my hair and my mother would always say you better comb your hair because you aren’t going to loc your hair ha. I grew up in a household in the Caribbean where my father always played reggae music from Bob Marley, Peter Tosh, Culture, Third World & my mother was in a reggae band so I would always see these musicians with locs ,I always had a fascination with them. I also chose locs because I never wanted to straighten my hair because I thought I wouldn’t know what to do with my hair, when it comes to my hair I am very simple, it’s either down, flip to the side or in a bun. Moreover, I hate to spend hours in a salon I have no patience ha ha. So all of those factors helped me to decide that locs were for me and it just goes with my personality,a free spirit. They were because they knew that this was something that I always wanted to do, even if they were not supportive I would not have affected my decision. Many people asked me “Why would you ruin your pretty hair?” That would upset me at times because I wondered how was I ruining my hair. If anything I was protecting it from chemicals and the elements but to each his own and everyone is different, I am very happy with my decision 4 years later. My routine is simple. I try not to use too much products on my hair because I don’t want my locs to have crazy build up that would attract lint and dust. When I wash my hair I’m sure to use a gel shampoo like Suave (their Shampoo’s smell amazing) something that isn’t white and thick that would get stuck in my hair. I do not believe in using shampoo that is specifically for locs. I rarely use conditioner because it always get stuck in my hair no matter how much I wash it out, therefore, I just eliminate that all together. I re-twist my hair with every three to four weeks however; I do touch ups on the front in between. I use Lets Jam! Shinning and Conditioning Gel Regular Hold, I swear by it I never get build up and it makes up for me not conditioning my hair because it keeps my hair moisturized. I oil my scalp with Jamaican mango & lime island oil. That is pretty much it. I don’t like to spend a lot of time on my hair so I keep it simple, I don’t want to weigh down my hair with a million products that are just not effective. My favorite shampoo is Head & Shoulders Smooth & Silky. I was searching forever for a leave in conditioner that would keep my hair hydrated between washes and retwisting, so I use Aveeno Active Naturals Nourish + Condition Leave-In Treatment. The product I have to have at all times is my Lets Jam Hair Gel, I would be stuck in a rut without it. I use it to re-twist my hair and do touch ups in between because I hate to see my hair looking all poofy, like a puppy that went through a wind storm Ha Ha!! I really love Carol's Daughter Tui Oil, it smells amazing and it keeps my hair soft and there is no build up which is important with locs that there is minimal residue. I don’t have any hair goals, because I try not to obsess about my hair & focus on it too much. I just want my hair to be healthy and grow longer. What's the biggest misconception about locs and those who wear them? There are so many where should I even start? People always ask how do you wash your hair? Or people who have locs smoke, are Rasta’s, we have bugs living in our hair (Like Seriously)?!? People believe that we are all obsessed about being natural (which I'm not). Like we are hippies or something. A lot of people think that once they see someone with locs that they had to cut their hair to begin their locs, which is not true for everyone. I didn’t cut my hair to start mine, my hair was never chemically straightened and before I began my locs my hair was a little past shoulder length and curly. There are numerous misconceptions I’m sure someone could write a book about all of them. I don’t really obsess about things, but lately I can’t get enough of these...ok I guess that is a little bit of obsessing..
• Chipotle Burrito’s (yum!) there is something about these big yummy wraps of goodness that I need to eat every week. • I LOVE accessories! Big, bold pieces. I would buy jewelry instead of shoes any day. • I am in LOVE with printed fabrics. Ethnic prints/African prints/animal prints...It just gives any outfit more personality. • Love nail art! • I adore wearing my hair up in a bun (not really an obsession but why not) • I am excited about wearing lipstick for summer reds, pinks, nudes all of them! Guest blogger, HeartfeltHoney, is back, but this time with a book review! In this video she reviews "Hair Story: Untangling the Roots of Black Hair in America" by Ayana Byrd and Lori Tharps. Check the video, discuss and don't forget to subscribe to HeartfeltHoney's channel >> HERE! Loving everything about this look from the socks to the big, loc'd up-do!! Product Description: Treat your hair to this yummy smooth custard. This product can be used on dry or wet hair. Using it on wet hair will give your twist outs and braid outs AWESOME definition and shine. Not to mention your curls will smell GREAT! My Thoughts: Alex, owner/creator of SafiHairCare, never seems to disappoint...I love this! The consistency is very thick and butter like, but once you get in your hands and it melts into a more creamy texture. I first applied Coconut Oil to my freshly washed, wet hair and then smoothed the Hairsicle Cream in to create medium sized braids. To seal I dabbed a little Castor Oil on the ends and allowed them to dry overnight. In the morning, I unraveled without the aid of any extra product...my hair was very soft and SHINY!! Crazy shine! The one mistake I made when using this product was using Coconut Oil, it really wasn't necessary. Paired with castor oil and the Hairsicle Cream it made my hair a little oily. Next time I'll just use the HC by itself, it's moisturizing enough on it's own. However, my mistake allowed me to achieve 5th day hair. It's not defined as day 1, but my hair is still soft and smells of lemon and coconut....YUMMM! If you are looking for hold, shine and moisture, with ingredients that you can pronounce...definitely put this on your list. She sells out quick so if your interested, don't drag your feet. My other favs from this brand are: Curl Clouds and Avocado Shea Butter. If you'd like to see the braidout in motion lol...please check out the Mop Top review. Hair Diary: Meet Tarin of Naturally Me Media!! About Me...I live in Atlanta and the natural scene is very prevalent here. You are guaranteed to see 3 or more natural hair women no matter where you go which is really awesome. Natural hair was really foreign to me. I was in high school at the time and I didn't know anyone who wore their hair natural. I stumbled upon Nappturality.com one summer day in 2004 and I thought the versatility and creativity on there was so beautiful. I clicked on that site and spent hours on end looking at Fotki pages of thick, luscious hair and I never looked back. After that day I began my first transition I would cornrow my hair every week. I had not had a relaxer in four months until my mother figured out what I was doing just in time for back to school. My mother disapproved of me going natural especially leading into my senior year with prom coming up. So I was forced into getting a relaxer! My last relaxer was May 4, 2005 for my senior prom. I transitioned for 10 months afterwards, using braids, rollersets, conrnrows, and even a few sew-in weaves (I had never worn a weave before then). I have know been natural for 5 years (Big Chop April 2, 2006). My current hair routine...I wash my hair once a week (if I'm not being lazy) and decide on which 1000th product to use from my mini beauty supply closet LOL! If it is a deep condition week I usually leave that in as long as possible as an excuse to not finish the job right away. I detangle (which is the longest part of the battle) and then I style. Styling is the fun part for me and I wish I had a personal shampoo girl to take care of the rest lol. I normally do styles that I create off of the top of my head, accessorize and go! •Organic Root Stimulator Lock & Twist Gel - great hold. This is my main stay for all styles really. I can't live without it! •100% Pure Shea Butter - great versatile product. I use it on my hair in the winter and my body. My favorite hairstyles...My favorite go to hairstyle is definitely a twist out. I love the versatility I can achieve by making the twists bigger or smaller. I also love to do creative styles --->HERE and retro updo's --->HERE. How has being natural changed you? Being natural gave me more confidence as I was somewhat shy growing up. I use my hair as an art expression and I use bold creative styles that always command attention. It has also allowed me to change other areas of my life regarding health including,drinking more water, vitamins, and exercise. The transition may be rough dealing with the 2 textures, but it was honestly one of the best decisions I have made. There is no magic pill to take to get long hair enjoy your journey no matter what length your hair is. Maintain a positive attitude, love your hair, and focus on the bigger picture of your new beautiful head of natural hair! Upcoming Fall 'Fro Fashion Week September 23-25, 2011. Curlfriends Collectables t shirts! 9 characters with different hair styles and personalities. To learn more about Tarin and all the exciting things she has going on highly recommend you visit her blog--> http://naturallymemedia.com and to stay updated on her latest tutorials and vlogs subscribe to her youtube channel ---> http://www.youtube.com/user/LadyTsTanglez. Rule out a medical issue. While everyone’s hair thins a bit with age and thinning hair can be genetic, it can also be a sign of a medical issue like anemia or thyroid problems. Debra Jaliman, MD, a New York City-based dermatologist, recommends asking an endocrinologist or dermatologist to rule out these issues. “Most medical doctors are not the ones to rule out medical issues. A dermatologist or endocrinologist would be the best medical experts to go and see,” she explains. A poor diet may also contribute. Fortunately, “if you lack iron and start eating red meats then the hair will regrow once your diet is appropriately balanced,” says Jaliman. According to Jaliman, biotin supplements (also called vitamin H for “Haar and Haut,” which mean “hair and skin” in German) can help thicken hair and strengthen nails. Though biotin occurs naturally in some foods, few food sources are rich in the vitamin, so during the 1940s, Swiss scientists developed a synthetic process to replicate it. Biotin supplements are now available over the counter, and Jaliman says they are extremely effective. The more contrast between hair and skin tone, the easier is it to see the scalp. Dumont has blond curls and says that when light hair thins, the effect is subtle. “You rarely see the scalp near the front or at the crown, like you do with dark hair,” she explains. If you have darker hair, Dumont suggests teasing it slightly at the crown to cover the scalp or going a little lighter to soften the contrast. “Streaks will do; it isn’t necessary to lighten the hair all over,” she adds. Even with lighter hues, thinning hair can show up around the temples, where the hair tends to be more fine to begin with. “Make sure that is covered with bangs or a side part with partial bangs,” suggests Dumont. “Curly hair that thins at the temples will make any woman look like ‘granny with a permanent,’ so it’s important to have a stylish hairstyle.” Good advice for all of us! 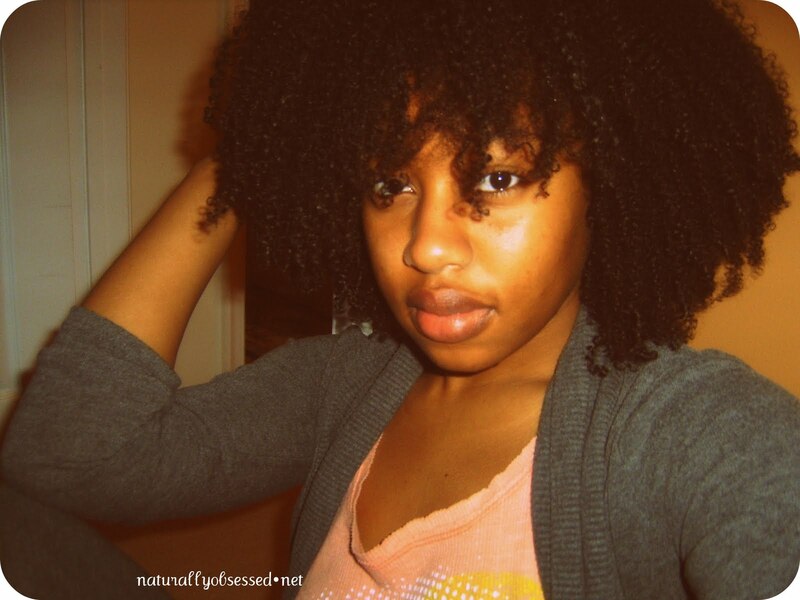 For more articles like this please visit NaturallCurly.com today! The products mentioned were sent to me by NaturallyCurly.com, courtesy of Mop Top. All products or tools reviewed on this blog are always 100% honest and fair to maintain the integrity of Naturally Obsessed. I was not paid for this review. For more info please review the Disclosure Policy at the top of the page. Thx -KKQ. Meet Fran of HeyFranHey, her Tumblr is one of my favs! She rarely posts pics of her own hair but her page is packed with good info and fly pics of all kinds of women. Visit her page --->HERE! Monthly • Shampoo followed by a overnight Rhassoul Clay Treatment. Detangle and style in the morning. Weekly • Cowash using a light conditioner like, Giovanni Smooth As Silk or Ori Organics Daily Deep Condish. Detangle and style. Bi-Weekly • Shampoo with a a mild cleanser like, Ori Oganics Hydrating Curl or Bee Mine Ayurvedic poo bar. Deep condition with Bee Mine Moisturizing deep condish. Detangle and style. Daily • If I'm wearing a wash & go I'll fluff and spritz with water or SM's Moisture Mist. If wearing a braid out, which is my usual, I just fluff and may add a Avocado Shea Butter or Hemp Seed Butter to smooth flyaways. Nightly • To preserve a wash & go I'll pineapple my hair. If it's braid out I'll put it in a low pony and cover with a scarf or rebraid. Whenever Wherever Whatever • I'll dust/trim and get rid of knots on my ends when it's necessary. I'm not length obsessed so I have no problem getting rid of shabby ends when I need to. I try to oil and massage my scalp every week, but I'm very lazy when comes time to do it. I still have my Huetiful steamer, but I haven't used it in a while though...for no reason other than laziness lol! If I feel like my hair needs a boost of strength I'll deep condition with Aubrey Organics GPB conditioner....this stuff is awesome, I forgot to mention it in my fav products video. If this regimen should change throughout the year, this post will be updated. **Note: I do test and review a lot of other products, but the ones listed above are my staples. Even if I give something a positive review it doesn't mean it automatically goes in my routine. It's important in any regimen to be as consistent as possible. This is my routine and these are my staples, but if you are currently building your own regimen simply use this as an example. Replace my fav products with your own favs and tweak it to fit your lifestyle. What's your regimen for 2011? "The last time I was pampered was for my 5 year wedding anniversary last March. My husband surprised me with a massage and facial at the spa and a weekend free of kids. It was really appreciated and fantastic". I received a sample of Darcy's Botanicals Peach Kernel Oil (smells amazing) months ago and this morning while trying to find some info on it I came across this chart. It's full of names and descriptions of many different oils, including the one I was searching for. According to the chart it's an excellent oil for dry, tired skin and is equivalent to Apricot Kernel Oil. I'm thinking of changing my OCM mix for the summer and maybe this oil will be included in that...I'll keep you guys updated. So if your a mixtress or a wanna be like me (lol) I'm sure you'll find this chart helpful!! Take a look---> HERE! To correct my situation I went through my hair cutting out any knots I found, I'm sure I didn't get them all so I'll search for the rest sometime this weekend. After the TT was laid to rest, I dusted off my wide tooth comb and set my hair in braids using Harsicle Cream from Safi Hair Care (yummy...review soon)...my hair is at peace lol! If your hair is still in love with TT by all means keep using it, but monitor your ends regularly for splits and knots. They can create tons of breakage if not taken care of. Read my initial thoughts of the Tangle Teezer---> HERE! Purchase and see more of her work---> HERE! Product Description: A light, leave-in conditioner formulated for medium thick, curly textures, Hair Nectar defines your curls, restores and renews your hair. Ingredients: Purified Water, Grapeseed & Jojoba Oils, Vegetable Glycerin, Vegetable Wax, Panthenol, Yucca, Horsetail, Nettle, & Melissa Extracts, Essential and/or Fragrance Oil, Natural Enzymes & Vitamin E Paraben Free. Protein Free. Silicone Free. Sulfate Free. Product Description: Made only from rich, thick butters and luxurious oils, Karen's Butter Love conditions, softens and adds sheen to fragile, stressed hair. Great for thick hair. The Butter Love may melt in transit especially during warm months. You can use it melted or put it in the refrigerator to solidify. The Butter Love can not be refunded or exchanged if it melts. All of our products are made by hand with natural ingredients. As in nature, there are always slight variations in the way ingredients look and feel. Saying that, the end result will be the same because when you use the Hair Butter, you rub it in your palms and it melts into a creamy oil. Ingredients: Shea Butter, Cocoa Butter, Mango Butter, Jojoba Butter, Aloe Butter, Essential and/or Fragrance Oils, Grapefruit Seed Oil Paraben Free. Protein Free. Silicone Free. Sulfate Free. In love with that beige jacket from Modcloth and maxi skirt from Zara!! Gorgeous! This is only episode one so make sure you subscribe ---> HERE to updated on their latest videos!Also check out their blog ---> HERE!! Yes Yes, I know last week's updates were almost nonexistent, but I just to take a "blogger breather" lol! You know..take a moment to focus on other more important things going on in my life. I haven't even fooled with my hair too much, it's currently resting in pigtail braids. However, it's absolutely gorgeous outside right now and I'm thinking I should do a wash & go. NaturallyCurly.com sent me some Karen's Body Beautiful products (Hair Nectar & Butter Love) to try so I'll test those out today and hopefully have a new review up sometime next week. I also owe you guys the Mop Top Deep Condish review...it's coming next week also! What have you beauties been up to?? Giveaway!! Win Body Balm From Soul Purpose!